The 3D printing technology is approaching many industries and one of the fields is the jewelry industry. The 3D printed jewelry was approached with many amateurs and professionals in in order to take the production process to a new level. 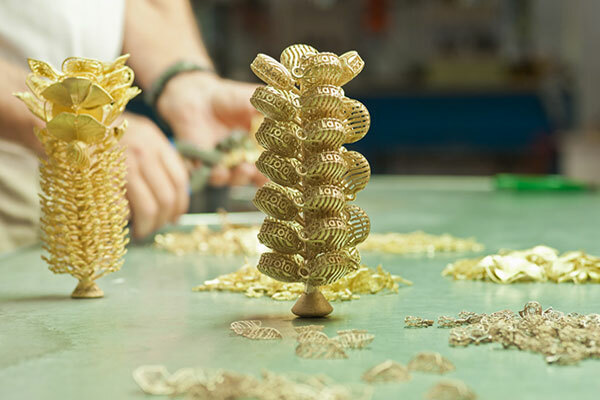 La Protofusione is one of the examples that implemented the rapid prototyping technology to create 3D printed jewelry and the results were fascinating, not only on the production level but also on the business level as well. “This new technology helps us stay afloat, in spite of the terrible economic situation, while remaining very competitive in the global market. If I did not have 3D printing, I would have shut own like so many others in this sector. Out of 2,600 brands a few years ago, only about 400 have survived.” said the company founder, Andrea Anastrelli. The company, La Protofusione, is based on Northen Italian region of Vento, where is the main global center of jewelry production industry. The company aims to innovate the jewelry production process using the rapid prototyping manufacturing to build 3D printed jewelry. The name was inspired by the process itself. The story started in 1998, when Andrea Anastrelli learnt about this new technology and then get introduced to the VIPER machine in Vicenza Gold Fair in 2002. he was fascinating about how the technology can be implemented in high level production. The Protofusione process starts with building the jewelry model using any of the 3D modeling applications. This gives the advantage for the makers to have an accurate preview for the model before printing it. Then, the model is 3D printed to act like the wax model, which is used later for microfusion. The 3D printed wax model is used to create the negative cast. Then, the gold or the sliver is poured in the cast to create the final shape of the jewelry exactly as seen in the computer model. The process enabled La Protofusione to create shapes that were not available in the traditional process such as the very thin walls and closed-up net shapes. The implementation of the 3D printing technology also helped to reduce the production cost through reducing the effort, time and cost spent during the process steps. On the economy side, this cost reduction and shorten the number of steps helped La Protofusione to survive in the struggling Italian economy. As stated earlier, the 3D printing helped the company not only to stay competitive in the economy but also prosper in the market.